Thank you to all of our generous supporters who responded to the Arvin A. Brown’s 6th Annual Fundraising Appeal Letter. Our goal for this campaign is to raise $6,000 and we just reached the halfway mark! We are grateful to all the residents of Richford and our patrons from the surrounding area for their support of all we do at the library. 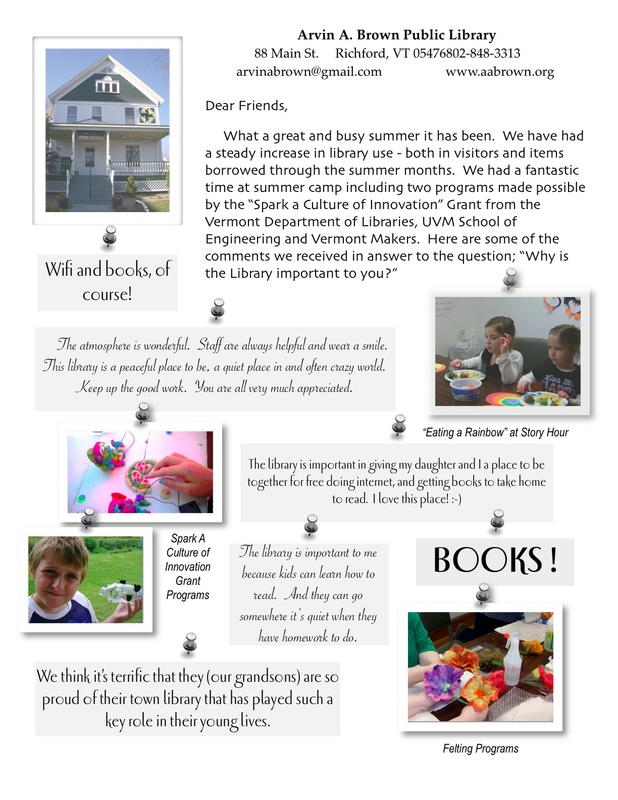 There are many FREE activities available at the library including borrowing books, DVDs, and magazines for all ages, downloadable audio and eBooks, after school programs, computer access and wi-fi, story hour, summer camp programs, Vermont Online Database, Universal Classes, book discussions and guest speakers throughout the year. At budget time we will be asking the Select Board for a $4,500 increase in our appropriation for 2015. That’s less than $2 per capita based on Richford’s population. That’s less than the cost of one issue of your favorite magazine! Please let the Select Board know if you support this increase for the library. This year we we need to fundraise about 20% of the total income we need to continue bringing you the materials and services you expect from us. That is why every donation is important to us! If you haven’t had a chance to contribute yet, it’s not too late to help us reach our goal. Donations forms are available here or at the library. Thank you again and don’t forget we are a PUBLIC library and you are the public – let us know if you have a request for a book or program.